Synth-pop band Propaganda was formed in Germany by vocalist Claudia Brücken and drummer Michael Mertens plus keyboard players Susanne Freytag and Ralf Dorper. The quartet moved to England in 1983 and signed to ZTT Records, also the home of Frankie Goes to Hollywood and Art of Noise. Propaganda's first single, "Dr. Mabuse," reached the British Top 30 in early 1984, but the band's second release was more than a year in coming. Finally, in May 1985, "Duel" trumped the debut single by hitting number 21. 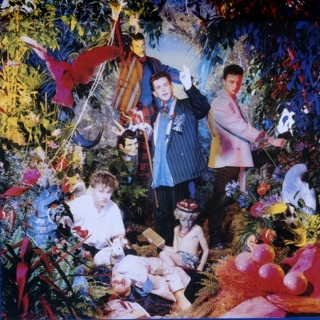 Propaganda's first album A Secret Wish appeared one month later, and the resulting tour necessitated the addition of bassist Derek Forbes and drummer Brian McGee -- both formerly with Simple Minds. After the release of the remix album Wishful Thinking later that year, Dorper became the first original member to leave the band, and Propaganda splintered soon after, due to a prolonged legal battle to leave ZTT. The group finally re-emerged in 1988 with Mertens, Forbes, McGee and American vocalist Betsi Miller. The quartet signed with Virgin, and released 1234 in 1990. The single "Heaven Give Me Words" broke the British Top 40 in 1990, and "Only One Word" placed modestly later that year.